As we said, gas fireplace costs can vary dramatically depending on what kind of unit you are looking for. We’ve taken different samples below so you can get an idea on what you are paying for. If you are looking for something just on the low end, you can expect to pay about a few hundred dollars or less. 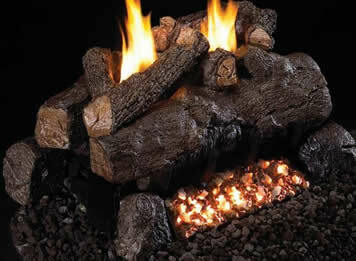 The gas log set featured here is the Peterson Gas Logs 18 Inch Post Oak Vented Natural Gas Log Set With G4 Burner. It is priced at $250. If you are looking for something a little bit nicer than just your basic logs, there is a huge variety of styles available. You can expect to pay something in the $500 to $900 range. The gas log set featured below is the Rasmussen Gas Logs 24 Inch TimberFire Vented Natural Gas Log Set With LC Multi-Burner. It is priced at $530. There are deluxe styles of gas fireplaces available that are the height of luxury and comfort. They provide incredible warmth, ambiance, and are indistinguishable from their wood-burning counterparts, without losing any of the great features that a gas system provides. 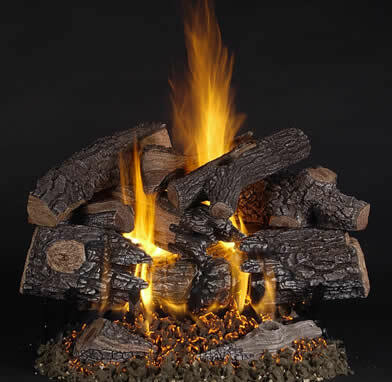 The gas log set featured below is the Peterson Gas Logs 18 Inch Evening Fyre See-Thru Vent Free Natural Gas Log Set With ANSI Certified G18 Burner And Variable Flame Remote. It is priced at $1,100. The cost difference between vented and vent-free sets are negligible overall. There are a few factors to consider when choosing between vented and vent-free sets, however, that might affect the overall cost. Ease of Installation: We recommend that you opt for the type of gas fireplace that is easiest to install seamlessly into your home. If you already have a chimney, we recommend going with a vented fireplace. It is simple to install and will utilize your existing venting channels (i.e. your chimney) without a lot of hassle. If you do not already have a chimney, either a vented or vent-less gas fireplace would be great. The cost of installing a gas fireplace can vary widely by installer, region, and your current home setup. Since vented fireplaces have to have a vent system installed to let the air out to the exterior, they can be a little more expensive. If you already have a chimney, installing a vented fireplace becomes a little bit less expensive, since the installer will not need to install a vent through your walls to the exterior. They can simply run the venting system through the existing chimney. Vent-less fireplaces can be a little less expensive to install since they do not require a vent. As well, if you already have an existing fireplace and chimney, you can save a lot of money on installation by going with a vent-less gas fireplace system, since you will not have to purchase a hearth or fireplace enclosure. 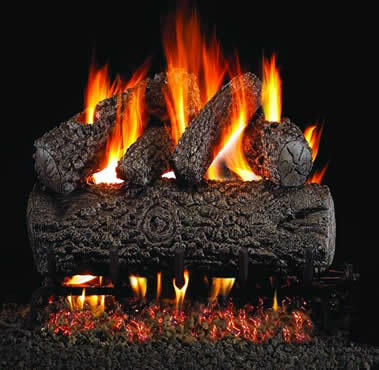 Most gas log sets, whether vented or vent-less, are pretty comparable in price. Vented gas log sets can be slightly less expensive. However, this cost evens out in the long run since installation costs tend to be slightly higher for vented than vent-less. A clear-view or two-window fireplace hearth can be an attractive addition to any room. These are hearths that allow you to view the fire from two sides. Often, they are put in the middle of the room, or between two rooms. If you choose to go with a clear view or two-window hearth, you can expect to add about $300 to $500 to the cost of your hearth, depending on the style. However, when judging the worth of the extra cost, keep in mind that you are effectively doubling your fireplace, since it can now be enjoyed in two rooms. While a remote control comes standard into higher end log sets, they can be added to less expensive log sets for around an additional 100 to 200 dollars. So overall you are looking at the extreme low end 350-500 if you already have a fireplace with a gas line and everything else is perfect. If you want a high end log set you are more around 1000. These costs are without enclosures or with out additional instalation fees, so depending on your exact situation it could be 350 to 4500 or more. To read about the operational costs of owning a gas fireplace click here.